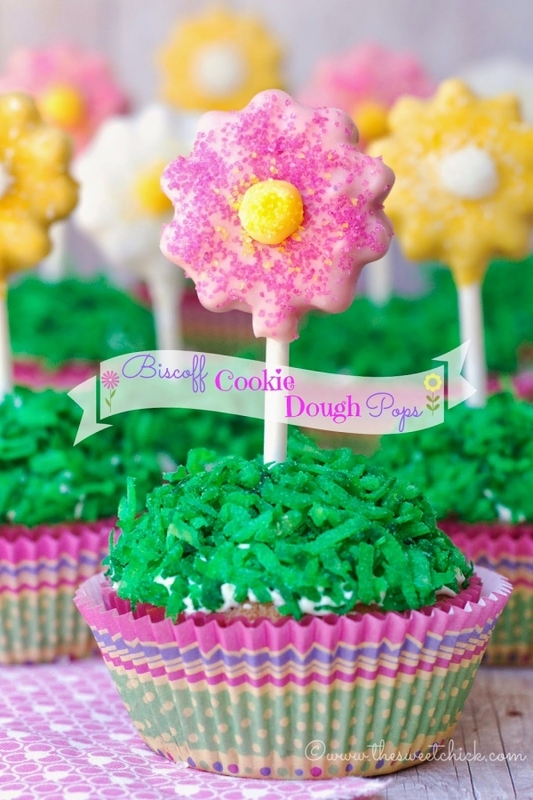 Special Mothers Day Cupcake Pops YUM!!! In a small bowl mix together the meringue powder and water, then add it to the mixer bowl and mix well. In a medium bowl combine the flour, baking soda, and salt. Next add it to the mixer bowl a little at a time while mixing on low until dough starts to form. Lightly dust your silicone molds with flour, removing any excess. Add a small amount of cookie dough to each cavity pressing down with your fingers until cavity is full, and making sure the top of the dough is flush to the mold. Place a Candiquik square in a small microwave safe bowl, and melt in the microwave according to instructions on the package (usually 30 second at a time until fully melted). Repeat process for all pops, using the different colored candy coating. Once all the candy melt has set, you really don’t need to keep these pops refrigerated. Remember there are not eggs involved. Just keep them in an airtight container. If you are using sugar crystals, sprinkle them on before candy melt is completely set.